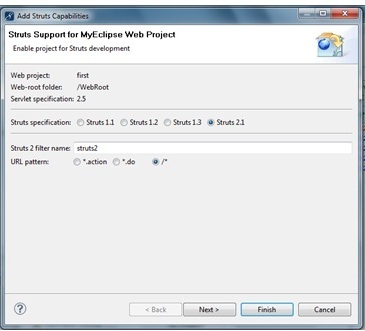 Here, we are going to create the struts 2 application using myeclipse ide. We don't need to care about the jar files because MyEclipse provides these jar files. You need to follow these steps to create struts 2 application. To create web project, click on the file menu - new - project - web project - write the project name e.g. firststruts - finish. To add struts 2 capabilities, select you project - click on the myeclipse menu - add project capabilities - add struts capabilities. Select the 2.1 and /* as the url pattern - finish. It uses struts core tags to create a form with fields. It is the simple action class containing properties with setters and getters. It contains the execute method also for defining the business logic. This xml file registers the action and view components. This jsp page displays the information set in the action object. To start the server and deploy the project, right click on your project - Run As - MyEclipse server application.